This post has 822 words. Reading it will take approximately 4 minutes. 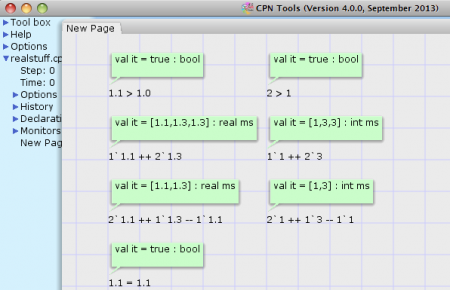 CPN Tools 4 adds a couple new types to make modeling easier. The new types are intinf, real and time. These types makes it easier to construct readable models as we no longer have to represent large numbers using strings, we can use real values without any rounding, and we can directly embed time stamps in tokens without any configuration. The intinf type works exactly like regular integers, except they do not have an upper bound. A new standard declaration for intinf types is created for new models as INTINF. The only reason for not completely replacing regular integers with large integers is that computation is marginally slower (this does not matter in practice) and they do take up significantly more memory, so especially for state-space analysis using regular integers is often better (if you need the full power of large integers, state-space analysis is not applicable anyway). We see three operations on integers: comparison, multiset addition, and multiset subtraction. They naturally yield the expected results. 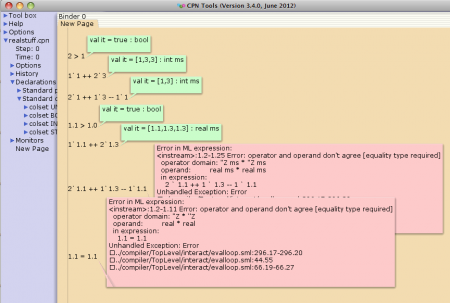 We then try the same three operations on real values. Comparison is good as is multiset addition. For multiset subtraction, we get an error which boils down to something with “equality type.” Digging deeper, we see that we cannot even test equality between two real numbers. This is a feature of Standard ML and it makes sense. It basically boils down to floating point values not adhering to the assumptions for equality types in Standard ML, which means there is a lot of things we can do on integers/strings/records/… we cannot do with reals. We can do basic simulation, as it only relies on inequality, but anything but the simplest models fail, and using reals in functions leads to strange behavior in many cases. Also, the state-space tool relies on types being equality types, so using real means no state-space analysis. While the value is displayed as 2.0, it is really entered as 2.000000000000001. As this is not the same as 2.0, the transition is not enabled. This can happen due to rounding errors in computations as well, so it is better not to make models rely on equality of reals. It is in fact better to not let your model rely on the values of reals at all. They can be useful for making measurements with non-integer values, which is perfectly fine. If needed, you can use inequalities (for example to filter “widgets” which takes more than 5.0 time units to process), but be aware that there may be rounding errors. 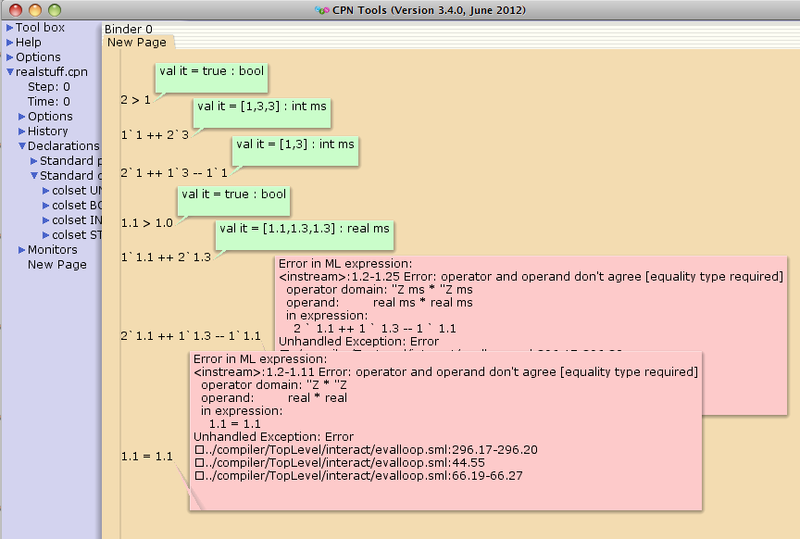 Aside from rounding errors, real types work exactly like any other type starting with CPN Tools 4. 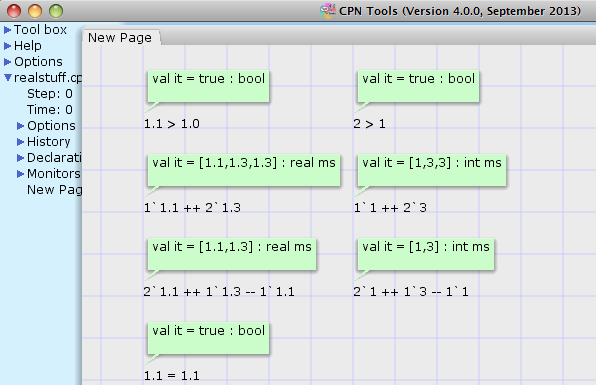 CPN Tools supports two kinds of time stamps: integers (really large integers) and reals. With the support for large integer and real types, it is now possible to store time stamps directly in tokens instead of resorting to translations to strings. This is good for legibility and accuracy. Instead of relying on the implementation of time stamps, it is possible to create a variable of the type time (TIME in the standard declarations). 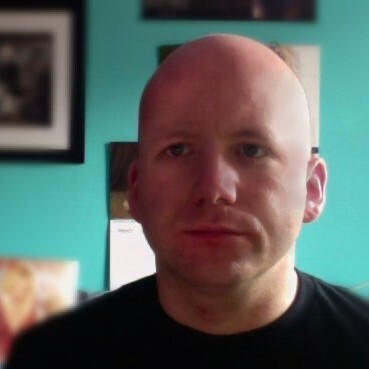 This automatically fits the current kind of time stamp. This is good for those rare cases where the type of time stamp is changed, but also for documentation. The type works exactly as either large integers or reals.